When students asked me about my dissertation (an occurrence I was prepared for far less than it actually happened), my initial response was either as brief as possible (“rabbinic reading practices”), or a lengthy narration about the day I ran along Providence’s tree-lined boulevards during which the various pieces of my coursework clicked together and I knew what I’d eventually be writing about. Neither of these answers, though, really represented the topic of my dissertation, and neither of them did justice to what still remains one of my biggest achievements. These days, I tend to start off explanations with a recipe: perhaps a relatively well-known one, like Julia Child’s recipe for chocolate mousse. Her cookbooks all have a distinctive look. The title of the recipe is in all caps, with a short description following in italics. The recipe then continues in two parts. Steps are narrated, bit by bit, and along the left margin of the page, ingredients and equipment are listed as they come into use. The page literally tells you how to use it; it is arranged so that the chef can easily know where to look for an exact number of tablespoons of sugar, or a description of how to whip a meringue (“with vigor!”). A variety of factors (layout, font, size) enable this, but perhaps the most basic is spacing. The divisions between words, lines, and sections tell us what each component of the text is doing; they make us aware of breaks and changes, and ultimately, show us how each individual part is related to the whole. These divisions—the practice of segmentation—shape how we read the text, and what we do with it subsequently. It is this set of observations that I applied to rabbinic reading of the Biblical text. These insights led me to a clearer picture of how verses, phrases, paragraphs, and parshiyyot (something between our idea of a paragraph and a chapter) functioned for the rabbis of late antiquity. The division of a text into smaller pieces was a fundamental practice of reading in the ancient Mediterranean world and shaped numerous other reading practices in turn. I began my dissertation by defining “reading.” This is already a dangerous enterprise, as reading, Leah Price paraphrasing William James says, is “too close for critical distance, and perhaps for comfort.” I am still unsatisfied with the definition I developed (“an interaction between a reader (agent) and a text, in which the content, or ‘meaning’ of the text is the operative locus of engagement”), but I preferred its active sense to the more passive “perception of an inscribed object.” My dissertation, while broadly interested in the wide scope of rabbinic reading practices, focused specifically on a type of reading whose evidence remains inscribed in our texts from antiquity: the close, analytic reading of texts that results in their division and subdivision into smaller units. My chapters centered around reading practices that utilized divided texts as their most basic, fundamental unit. The first chapter in the finished dissertation was on educational reading, although this was not the first chapter I wrote. It is a truism of writing a dissertation (or at least, it was for me) that the first chapter written is not the chapter that comes first. I tried to begin with divinatory reading practices, especially bibliomancy, and only after finishing a draft of that chapter did I realize that there was more to rabbinic bibliomancy than the simple application of verses to situations. If I was going to do this right, I had to figure out where those verses came from—what processes of reading created the understanding of the biblical text as something that could be torn apart, atomized, and then woven back together. I found the answer not in divination, but in education: in the rabbinic insistence, present throughout their earliest texts, that learning was a process that happened piecemeal, bit by bit, word by word, verse by verse. This chapter on educational reading, which became the first, organized itself around two distinct practices: that of excerpting, and then the repetition of excerpted units of text. In recognizing that excerpting and repetition were central to the rabbinic enterprise, I tried to place them in a long history that began with Hellenistic grammarians teaching Homer in Alexandria, as well as a broad cultural context as reflected through the Syriac Cause of the Foundation of the School of Nisibis. Even after this chapter (which eventually became long enough to become two chapters), I still wasn’t ready for bibliomancy: rather than jumping directly to the random selection of verses, it made more sense to focus on slightly larger chunks of text. Rather than thinking about verses, or even chapters (which are, to a great degree, an anachronism when we’re talking about the rabbis), I moved on to the next-largest meaningful chunk of rabbinic textuality: the parashah. Parashah is a funny word: it’s a practice, a large division, a small division, an interpretation. It suggests the physical form of the text—often times, a parashah is identified by its opening and closing line breaks—as well as the performance of a lectionary. The strategies utilized for actually creating these paragraphs, readings, and lectionaries were varied, and sometimes informed by the physical makeup of the text, and at other times by the narrative content—but always shaped, it seems, by the guidelines invoked for dividing up texts within an educational context, which in turn shaped and were shaped by larger literary sensibilities. In this way, they were similar to the strategies used by Hellenistic readers of Homer when they divided two epics into two poems of twenty-four books apiece. With these insights in mind—that the rabbis placed great stock in dividing the biblical text into smaller units, and that the formation of these units had consequences outside of the world of the text—I moved on to tackle divination. The first part of the chapter dealt with a practice not often considered divinatory: writing commentaries. It became more and more apparent to me from both the practice of pesher and various types of rabbinic continuous commentaries that this was yet another way of seeking extra knowledge from texts: divination. Scholars have shown the relationship between these forms in other literatures; I decided to do my best to argue for it among late ancient rabbis. The balance of the chapter deals with bibliomancy: a practice by which rabbis utilize randomly selected verses to tell the future (or in some cases, the present). The most famous example of bibliomancy occurs in the story of Acher the apostate, on bChagigah 15b: a rabbi drags Acher from schoolroom to schoolroom, asking young children to recite whichever verse they happen to be learning at the moment. The result is always the same: even though the verses are all different, there is no hope for Acher’s return from apostasy. The vocabulary utilized for bibliomancy is highly textual, and even technical, and two of the most famous scenes in early Christian literature—the “conversions” of Antony and Augustine—are based on bibliomancy’s divinatory logic. By adding the rabbis into the mix, we can think a little more critically about how ancient Mediterranean textual experts conceived of their texts. From my current vantage point, the last body chapter of my dissertation is the one that seems to fit the least. At its core, however, it is takes up some of the implications of the earlier chapters. 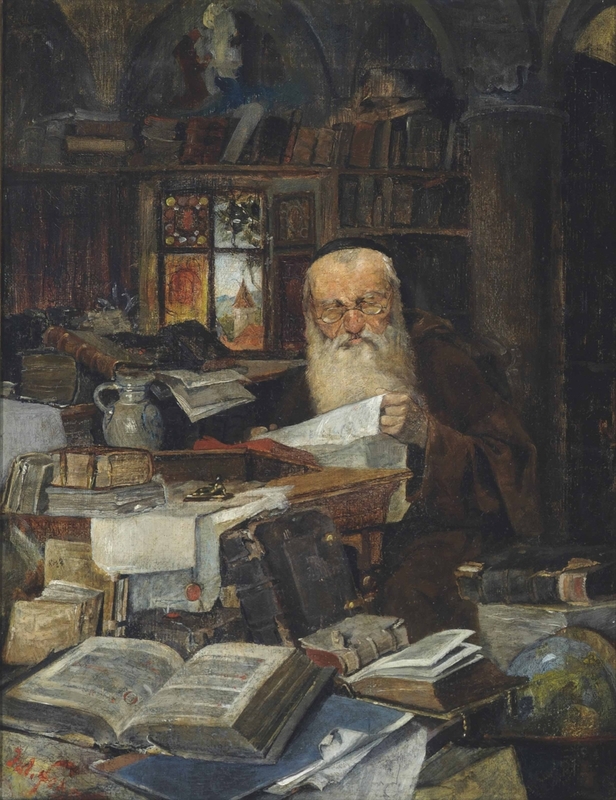 I argue that that the rabbis are deeply concerned with the form, format, and divisions of the biblical text, and that these aspects of the text have a crucial role in rabbinic understandings of the formation and transformation of the reader. I look at three different texts from the Babylonian Talmud to draw out some of these themes. Readers are given special abilities, they accrue divine merit, and their dispositions are entirely changed based on the texts they read, and the ways in which they do it. Again, the rabbis were hardly alone in constructing their texts this way. Jerome and Athanasius are all too willing to tie the bodily postures of reading with the ways in which those postures change the reader, direct the heart, and move the soul. There are, of course, broader concerns that motivated this work. At the heart is a long-standing conversation about the orality of rabbinic culture, and the exceptional nature of the rabbinic movement. I hoped to make clearer claims about both when I set out—that the rabbis were yet another group of religious specialists in the late ancient Mediterranean, and that reading is, in fact, a useful category for describing and analyzing their practices. When I think back to Julia Child’s chocolate mousse recipe: there were countless recipes for this treat when she wrote her first cookbook, but the decisions she made in writing it for her readers enabled future generations of chefs, researchers, and amateur bakers (like me). Similarly, the rabbis might have lived in an intensely competitive environment, but it was the choices they made about how the biblical text should be perceived, read, and divided that scholars are still grappling with today. for Innovation in the Humanities and Judaism at Carleton College. Leah Price, “Reading: The State of the Discipline,” Book History 7 (2004) 303-330.